The HAIX Climber is a highly torsion-resistant safety boot which has been developed in conjunction with engineers who work for electricity and energy providers and specialised in climbing pylons. It is also a popular choice in the landscape gardening sector. 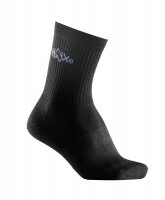 The Climber forms part of HAIX’s Workwear Collection and will keep your feet dry in both summer and winter. A four-ply GORE-TEX® membrane ensures that no rain drops are able to penetrate the boot. Sweat is expelled via a process of evaporation to keep your feet dry, even on hot days. The Climber also features a plastic/fleece insole and an anatomically formed inlay to assist with the absorption of moisture. Pigments in the black leather used in the boot’s construction reflect the sunlight in order to avoid any unnecessary heating. This leaves your feet feeling fresh and comfortable, even after many hours of wear. A bold tread provides a firm grip on any surface, including on wet ladders and platforms. The sole has a broad rubber edge to support lateral stability, whilst a wide toe cap prevents injuries from falling objects or other kinds of impact. The HAIX Climber is both safe and comfortable. An integrated leather reinforcement over the heel rounding ensures that no chafing takes place in this sensitive area. At the same time, you will enjoy plenty freedom of movement, such as when you need to kneel down. An impact-absorbing PU foam wedge cushions your steps and thus reduces pressure on the back and joints. Your feet will remain fit and free of pain, even after having covered long distances. 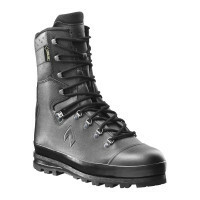 The HAIX Climber is manufactured in genuine bull leather. This is a particularly robust and hard-wearing material. The leather itself has been hydrophobised, i.e. specially treated and thus rendered watertight. It also includes pigments which reflect the sunlight in order to reduce the amount of warmth transferred to your feet. The toe of the HAIX Climber is equipped with an extra rubber element to help prevent wear and tear. A four-ply GORE-TEX® membrane in the inner lining makes sure that your boot remains watertight. Rain and other liquids are unable to penetrate. At the same time, this also enables the feet to “breathe”. The lining itself is abrasion resistant and provides comfort of wear in any weather. A padded and extra-wide toe cap prevents injury from falling objects such as branches or tools. 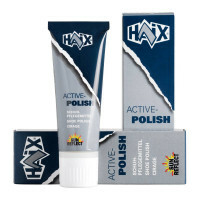 The HAIX Climber also features a plastic/fleece insole to assist further with the absorption of moisture. This is a boot which offers a high degree of torsion resistance – i.e. extra lateral stability to prevent any twisting. Your feet will retain a firm grip at all times. There is also a fast-drying anatomically formed inlay to absorb sweat. This can be removed and washed if required. A PU wedge is integrated into the heel of the boot to cushion your steps as you go and reduce any strain on the joints or spine. The sole of the HAIX Climber is manufactured in an abrasion-resistant and anti-slip rubber compound. A deep tread gives a secure foothold on different surface, including icy roads and slippery ladders. Rubber strips to the side provide additional stability to the foot. The sole is also colour fast and will not leave any ugly black marks on light-coloured floors. The HAIX Climber forms part of the Workwear Collection. It makes a major contribution towards ensuring health and safety at work, particularly for gardeners, tradesmen and industrial workers. The HAIX Climber is completely waterproof and highly slip resistant. Its reinforced toe cap prevents injury to the front area of the foot, whilst an impact-absorbing PU wedge cushions every step you take. Try out these comfortable safety boots now!